Desmond Tutu denounced religions that discriminate against LGTB-identified people by making some very strong statements during the United Nations’ launch of its gay-rights program in Cape Town this Friday, reports AFP. I would not worship a God who is homophobic and that is how deeply I feel about this. I would refuse to go to a homophobic heaven. No, I would say sorry, I mean I would much rather go to the other place. I am as passionate about this campaign as I ever was about apartheid. For me, it is at the same level. South Africa’s iconic retired archbishop, Desmond Tutu, said on Friday that if he had his pick, he’d go to hell before heading to a heaven that condemned homosexuality as sin. “I would not worship a God who is homophobic and that is how deeply I feel about this,” he said, by way of denouncing religions that discriminate against gays, in Agence France-Presse.. He made the remarks during the United Nations‘ launch of its gay-rights campaign in Cape Town. 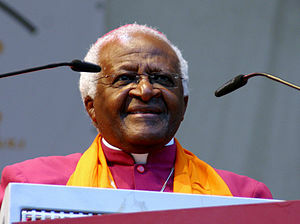 Mr. Tutu also likened equal rights for gays to the fight for equal rights for blacks.